There are many ways to have fun with chocolate bark. You can use dark or white chocolate, add nuts or dried fruits for an added kick. 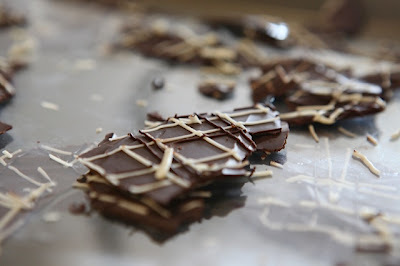 Today, I'm making thin pieces of chocolate bark to use as a side garnish for my mini creme brulee. They are super easy to make but will look like you spent all day on them! Whatever the occasion, they are soooo much fun to make and will surely please all of your guests! Place your parchment paper or plastic transfer sheet on a cookie sheet and set aside. Watch the video below to see where I got my plastic transfer sheet. Take your dark chocolate and chop it up into smaller chunks. Microwave for 1 minute(if you are using a full bar of chocolate), remove and stir. Place back into microwave, and microwave for another 15 seconds. Stir until smooth. If you need to, continue heating chocolate using 15 second increments. Don't overcook it. If you do, it will become grainy and you will have to throw it out! Using a spatula, spread a thin layer of melted chocolate onto your plastic transfer sheet. Reserve a small amount and place into a disposable piping bag for later use. Place the chocolate in the fridge and allow to harden while you continue with the white chocolate. Melt your white chocolate using the same process as stated above. Place it into a disposable bag and snip off a tiny bit off of the end. Start to drizzle the white chocolate over the dark chocolate using whatever technique/design you'd like! Allow the white chocolate to harden before drizzling some dark chocolate over the tops as well. Place finished product in the fridge and allow to harden overnight. Break up pieces of your chocolate bark and use it in whatever way you'd like! Place your heavy cream, creme brulee coffee creamer, and vanilla bean paste in a pot and bring it to a quick rolling boil. Turn off heat, remove and set aside. Allow to cool for 20 minutes. While your cream mixture is cooling, take your caster sugar and whisk it into your egg yolks until it's a pale yellow color. Once your heavy cream mixture has cooled slightly, pour it into something with a spout to allow easy pouring. Pour in a few dribbles of heavy cream into the egg yolk mixture to temper. Never stop whisking to prevent cooking your egg yolks. Slowly, start to incorporate the heavy cream in a steady stream and once you've got half of it mixed in, you can start pouring in heavier streams until you're done. Strain the mixture using a fine mesh sieve and again, pour it into something with a spout. Take a roasting pan or cake pan and place your mini ramekins in them. Transfer your pan onto your middle oven rack(careful your oven is hot, duh)and slowly fill each ramekin. 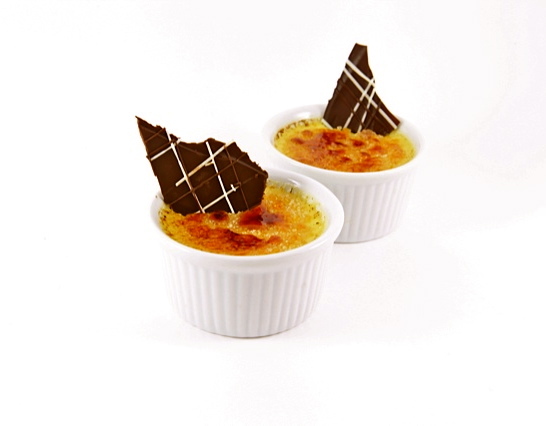 SLOWLY, add in some hot water, being very careful not to get any water into your creme brulee. Bake for 25- 30 minutes if you are using mini ramekins or up to 45 minutes or more for larger ramekins. They are done when they slightly jiggle in the middle when tapped. Remove from oven and let them cool before placing in fridge to allow it to fully set! I recommend leaving them overnight, which is great cause I love being able to do things a day ahead before a big party! Remove from fridge and allow to come to room temp before adding raw sugar to the tops and torching. Wait 5 minutes to allow the tops to harden, then serve immediately! Notes: If you can't find raw sugar and only have white granulated or brown sugar on hand, I recommend that you "dry" them out before you torch it. I would place an equal amount of white and brown sugar, on a cookie sheet and place it in the oven immediately after you've finished baking the creme brulee. Prop the door open and place the cookie sheet on the lowest oven rake if possible. "Bake" for 10 minutes, let it come to room temp, and then proceed with torching.